Listed below are Hawaii's illustrious Granders. These are both black and Pacific blue marlin caught in Hawaii waters that have weighed 1,000 lbs or more. If you have additional information on the marlin listed, other granders caught in Hawaii's waters, or have a better photograph than the one depicted, please share it with us. Contact us at hawaiifishingnews@gmail.com. 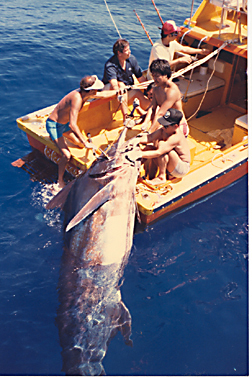 In Hawaii's waters even small boats have the opportunity to catch monster-sized fish like the revered 1,000-lb marlin. Some of the largest marlin in the world have been caught near the shores of the Hawaiian Islands in some of the smallest boats you can imagine! In fact, the largest blue marlin ever caught on a rod and reel was caught by Capt. Cornelius Choy and his daughter Gail on the COREENE-C in 1971. The fish weighed an astonishing 1,805 lbs. The fish to the left is a 1,269-lb Pacific blue marlin caught by Capt. Lee Gonsalves, Jesse Masagatani and Tommy Medeiros on the boat, EKENA ELUA, in 1986. They were only 15 miles off the windward coast of Oahu when the marlin attacked a lure. It was the second grander in two days for the fishermen plying the windward coast. Fishermen capture 1,000-lb grander 21 miles south of Honolulu! Read the 2009 story here. Watch the crew of the KALEI-PUA haul in their massive 1,032-lb pacific blue marlin! Read the crews story here. Special thanks to Tanya Makinney for sharing this with HFN!